With convenient access to Disneyland Paris, the 4-star Park&Suites Prestige Val d'Europe offers guests a stylish place to stay, close to the famous theme park. The air-conditioned apartments come with cosy bedrooms, separate dining room areas as well as fully equipped kitchens, and also include wi-fi access and flatscreen TVs. Guests can make the most of personal massages, water aerobics and hammams in the nearby Aquatonic Spa, and there’s a range of drinks available at the lounge bar. This modern 4-star hotel is a short drive from Disneyland Paris, the Centre Commerical Val d’Europe and the Marne La Vallee station, for easy access to the heart of Paris. After an exciting day exploring the sights, you can unwind at the nearby spa, where you get a discounted rate for being the hotel's guest, or in the lounge bar. The hotel’s studios and apartments all have a flat-screen TV, free wi-fi, kitchenette and private bathroom with shower and tub. 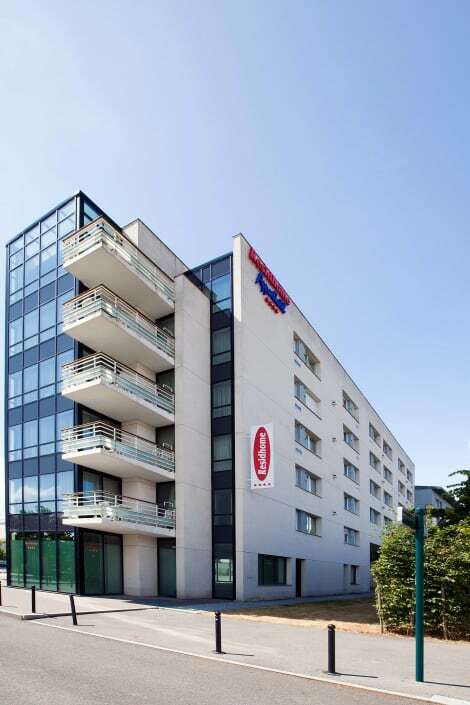 In the city of Montévrain, close to Disneyland Paris, Aquarium SEA LIFE Paris and the Val d’Europe shopping centre, is the Residhome Val d’Europe, a cosy, family-friendly 4-star hotel. Make yourself at home in your air-conditioned room with satellite TV and wi-fi access, and rustle up a snack in the in-room kitchenette, complete with fridge and microwave. Start your day with a buffet breakfast and ask one of the friendly staff for assistance with booking tickets and tours. With a stay at this apartment in Montevrain, you'll be a 3-minute walk from Val d'Europe and 11 minutes by foot from Val d'Europe Shopping Center. This apartment is 2.6 mi (4.2 km) from ® Paris and 1.1 mi (1.8 km) from La Vallee Village. With a stay at ibis Marne La Vallée Val d'Europe in Montevrain, you'll be a 3-minute walk from Val d'Europe and 9 minutes by foot from Val d'Europe Shopping Center. This hotel is 2.8 mi (4.5 km) from ® Paris and 0.9 mi (1.5 km) from La Vallee Village. lastminute.com has a fantastic range of hotels in Montevrain, with everything from cheap hotels to luxurious five star accommodation available. We like to live up to our last minute name so remember you can book any one of our excellent Montevrain hotels up until midnight and stay the same night.